At home we love lobster, we typically order them whole to celebrate my birthday. Though this week Whole Foods is having a special on lobster tails – yeah! That was super amazing! 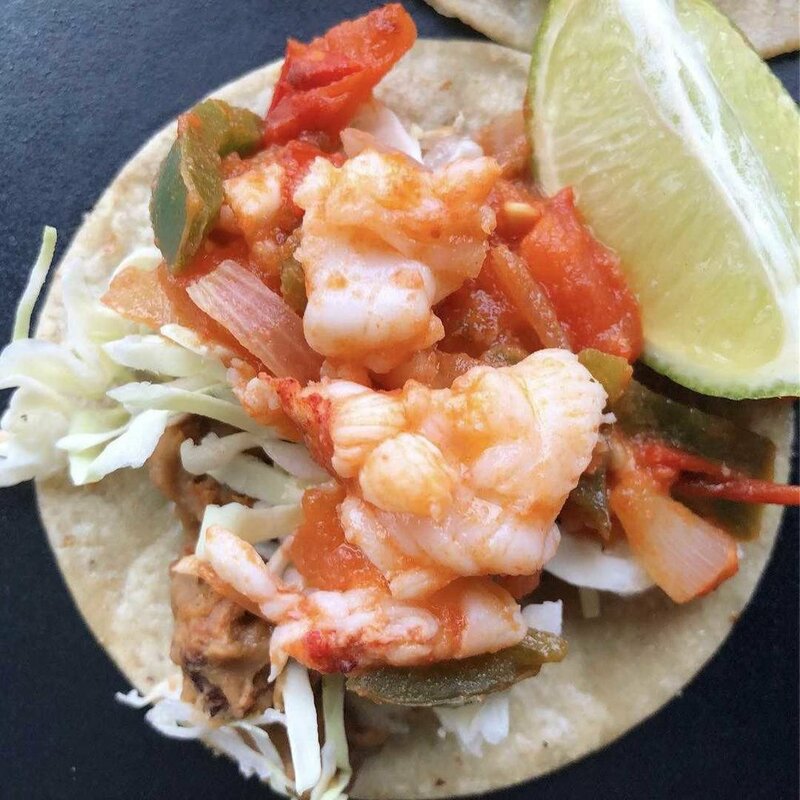 So… Lobster tacos it was. We prepared them Baja California style meaning sautéed with tomatoes served with super lard beans and white cabbage on a white corn tortilla. Hope you get to enjoy these – they feel super indulgent… definitely one of my all-time favorites. Don’t want to splurge on lobster? You can easily substitute with shrimp. Start by making your roasted red salsa – you can make as much as you want, its great with pretty much everything. You can also adjust the heat – we like it spicy, so we added habanero thus you can use serranos or only jalapenos instead. Set your oven in broil setting. In a baking sheets set your ingredients except vinegar. Char all of them making sure you are flipping them. Set all the ingredients in a blender, add vinegar and blend until smooth. Add salt to taste. Super lard beans are next…ok, so this is not for your diet, but they do taste amazing. Sorry not sorry. Start by blending the beans until completely smooth. In a cast iron or nonstick pan, add 1 tablespoon of the lard then add the chorizo. Fry until fully cooked (5 minutes). Add the remaining of the lard and melt through. Add the salsa and simmer to thicken a bit – 4 minutes. Add the beans and mix well. Lower the heat to low and cover. Every 5 minutes come back to it and mix around. After 15 minutes add cheese and mix well. Keep it a very low heat or you can turn it off – they are ready. Take the meat out of the lobster tail and roughly chop (not too fine – bigger bite chunks). Set aside. In a cast iron or nonstick pan, heat up olive oil and add onion with jalapenos. Fry until onion is translucent then add tomatoes. Simmer until you get a nice sauce (sofrito)/ cooked tomato. Add lobster and cook for 3 minutes or until flesh turns opaque. Salt to taste. To serve, heat up tortillas with butter. Set on a plate, add a teaspoon of beans, shredded cabbage and top with the lobster mix. Serve with lime and enjoy with a beer!